Alex only just convinced the border security of his “healthy” constitution (despite having to sit down every thirty two seconds and having skin paler than a homeschooled child in England) we were lucky a third time; an Iranian truck driver who couldn’t open the shipping container on the back of his B-Double insisted Iranian style that he would help us: he strapped TanNayNay to the back of his cabin and drove us the final eighty kilometres to Bukhara. This was an elegant solution to the alternative which was wait for tummy and knee to magically fix themselves whilst sitting in the sand at the border. 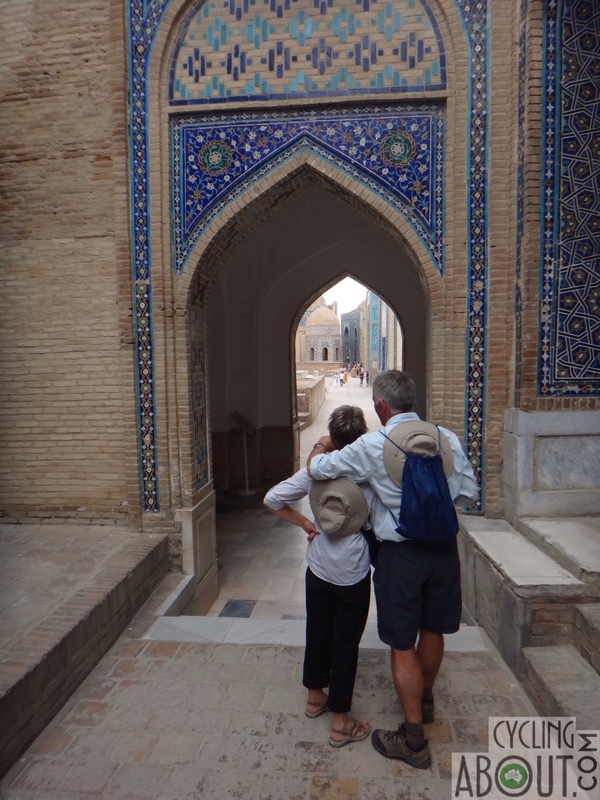 We passed Alena and Marcel (our driver puller over and we pulled them into our arms, heavy with regret that we couldn’t have ridden with them) and agreed to see one another in Bukhara. We were dropped gently at the outskirts of Bukhara where we used a truly abominable toilet at a cafe owned by very kind men. We decided to saddle up and push on before nightfall but were thwarted by the altitude of the prices at the two hard to find hotels we visited. Instead we stopped, we sat in the dust and wondered what to do. Upon glancing around the dirty dry dust bowl of a crossroads we were perched at we noticed a group of glamorous and amorous young women and their children behind us. Kat wandered over and soon we ‘moosh’ and ‘jshenna’ (husband and wife) were welcomed inside to stay the night. We were immediately offered the best perch in the roost, the chai table (which is very much like a large, low picnic table) which we gladly took and set up our little tent to get some privacy and protect ourselves from any nighttime bugs. The three young children were endlessly fascinated with us and our ‘palatka’ (tent) and stood unblinkingly at the door for minutes at a time. With this place to stay, Alex began to feel better, he was emerging from the illness at the same time as Kat was blundering blindly towards it. As the night grew old, Kat’s body became the sick sad residence of a very uncomfortable stomach bug (although the stomach bug himself had settled in just fine thank you very much!). We said goodbye but not farewell (we intended to visit them at least once again) and headed further into the heart of Bukhara’s small, sandy coloured centre. 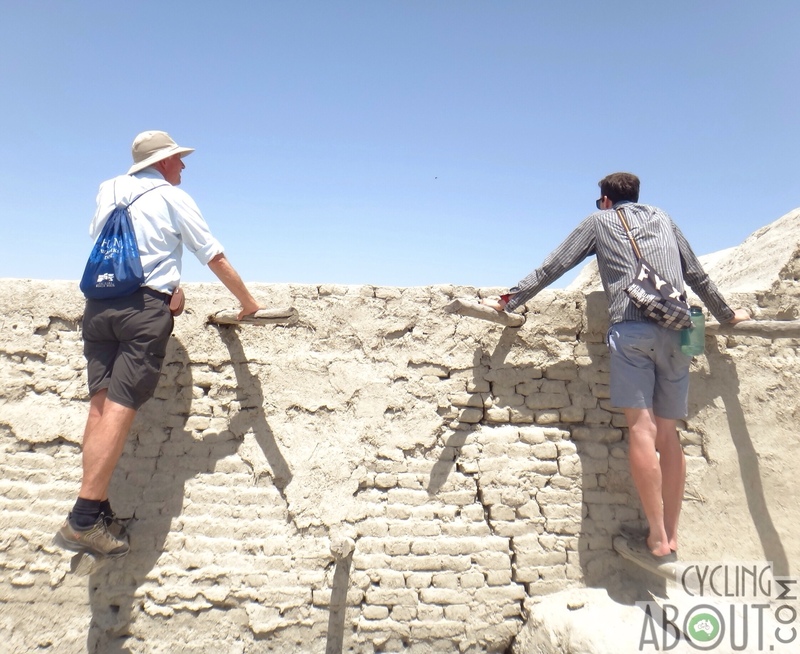 Our itinerary for Bukhara outlined dates to arrive, but it turned out we had an old, redundant one – after all that hurrying we were one day early still! We checked into Sasha and Sons’ Hotel regardless and proceeded to sleep away most of the day and night – hidden warm and cosy in our plush, technicolor room. Bang on seven o’clock am and there was a bang bang bang! A knock on the door and surprise! There they were! What a sight for sore eyes and hearts. Kat’s parents, Ruth and Andrew had travelled a long way and finally, on the date of our anniversary of being apart one full year, and their wedding anniversary as well – we were reunited. We spent hours talking and sharing and being given gifts! Well, a whole lot of stuff they’d been hauling around on our behalf (new clothes, yay!). We trooped downstairs to breakfast and were greeted with fresh fruit, yoghurt, muesli, cereals, pancakes, omelettes, dried fruit, green tea, black tea and of course, coffee! Much of the next few days was spent in wonderfully close quarters, and too with Marcel and Alena whom we managed to catch up with a number of times for delicious dinners. We spent the days talking, eating, not eating, feeling a little sick, recovering and going on a very full full-day tour of the city. Bukhara is one of the two ‘sister cities’ of Uzbekistan. She’s slight, with a small scale close knit centre with lots of tawny sand-coloured building and a natural beauty. Her sand and turquoise theme covered many buildings and monuments: madrases, the Chor Minor, every shop front was richly framed. Mulberry trees lined the streets, and were a welcome shade from the heat – a casual 40 dergrees and above every day. We met the local football team, investigated the five best restaurants and were given chai and watermelon while shopping at the carpet shop. We admired the Amir’s palace, especially its plumes of peacocks. 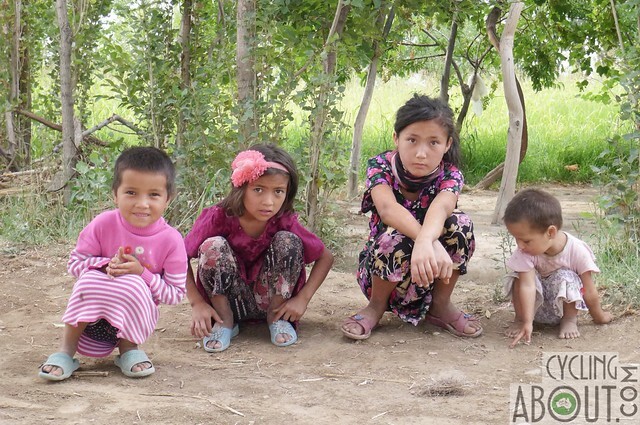 The whole city was paved with artisans and Uzbeks – it was touristic, but very much a place for real life. In the back streets we witnessed our first instance of kids swimming in public pools and fountains. Because what else are they good for?! 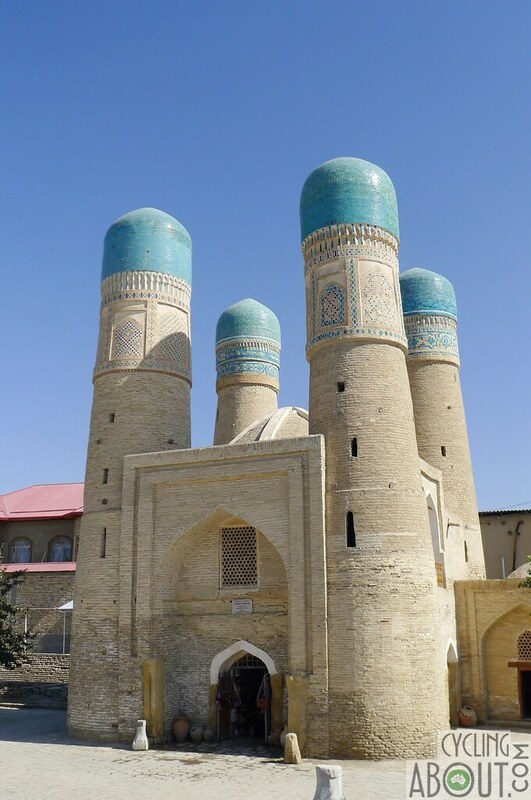 We took the train to Samarkand – Alex got TanNayNay on with force and a casual pretence of not understanding the protests of the guards. No bribes were paid and she wasn’t in anyone’s way. The train was too hot to get out of your seat anyway! 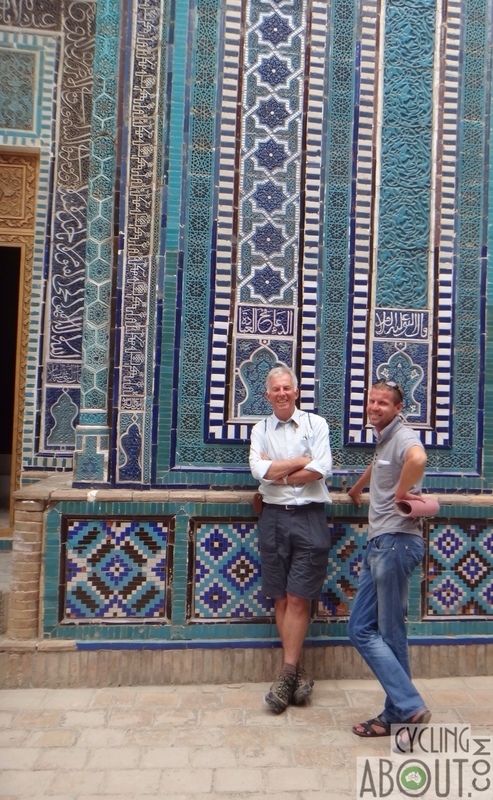 Soon we’d arrived in older, sassier sister city Samarkand. Kat, Ruth and Andrew piled all three in a minibus with bags and panniers on top, beside and below. Alex rode behind the extremely courteous taxi driver all the way to the Fur Kat Homestay. Two peacocks greeted us and kindly allowed us to stay in their home. There we experienced a seriously weird breakfast complete with über sweet cakes and poor quality chocolates, but with one home-cooked addition each day which was by far the tastiest of each meal. 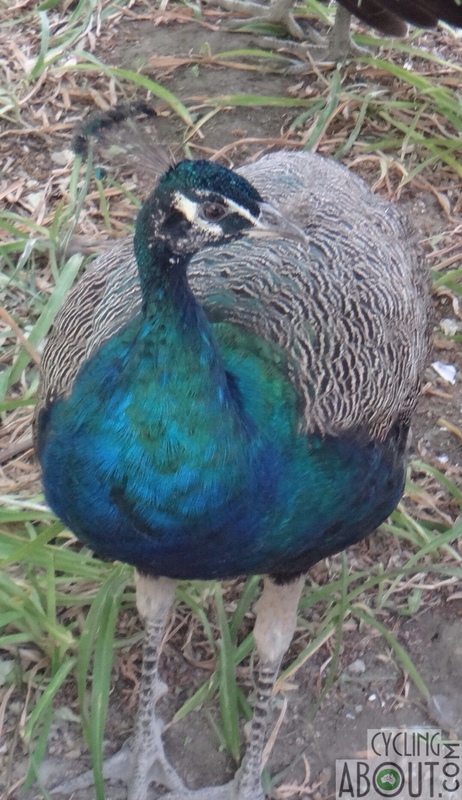 The peacocks delegated the task of servitude to various humans but we all knew who was in charge. 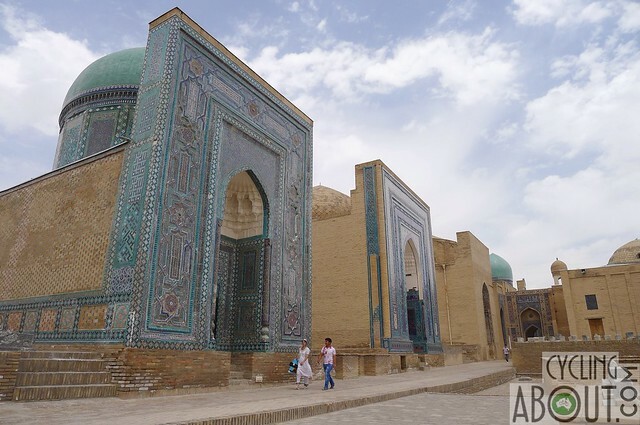 Samarkand was ready and waiting to be perused – she had her best dress on, resplendent in the sunshine. Dennis was our guide – an English-speaking chemical engineer, a third-generation Russian-Uzbek (who considers and describes himself as Russian) who had casually changed careers to where the money is! We visited a whole host of ancient sites – draped in history and often dripping in colours. 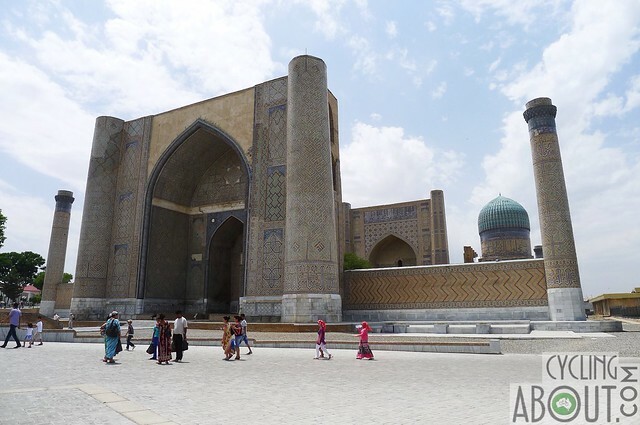 Yes, Samarkand is a pretty lady. The Ulugh Beg Observatory built in the 1420s was a particular favourite with its 50m deep underground sextant and other fascinating tools for astronomy, star gazing and most probably navel gazing. The main Mausoleum complex, a street of tombs was extravagant and fascinating. There were some pretty incredible people buried there. The tomb of the prophet Daniel has many stories associated with it, not in the least one about his arm (which is apparently the only part of hime actually buried here) which is said to have continued growing in its grave. Something great will happen once the two ends of his arms have grown all the way around the world’s circumference and touch together – we cannot wait to find out what it is! Outside it was a prayer tree with a strict order of touch and climb to receive blessings or wishes effectively. Considering we couldn’t grasp this structure we decided to watch the lucky ones instead. We also didn’t drink from the communal trough of holy water with the bucket loads of other visitors. There was a lot of carved and tiled decoration – not the least to be seen in the epic Registan ensemble and just near by in the King’s tomb. Around these areas were the sites close enough to our hotel for evening constitutionals. On one such stretching of the legs, Andrew was drawn in by the loud noise and bright lights of a wedding party. We were all invited in but declined, however, Alex and Andrew got talking to Ozod (the groom’s cousin) who invited us to his home the next day for lunch, just casually as if this kind of thing always happens at weddings. And who’s to say it doesn’t?! Ruth and Andrew were excited to have an ‘Alleykat’ experience where meetings and friendships with locals just happen. 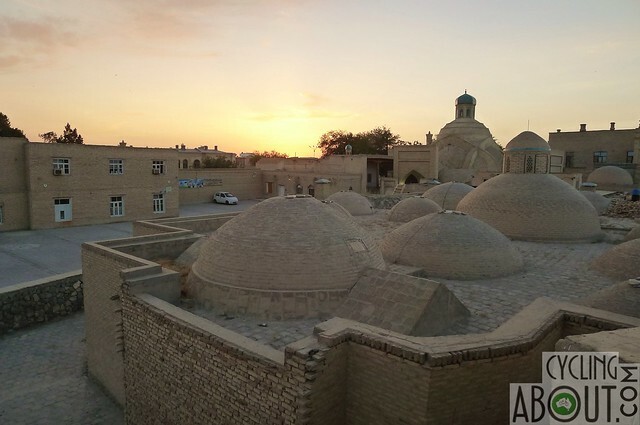 We met Ozod by the King’s tomb – and followed his sports-sandalled feet around and around the little backstreets, until we arrived at a regular-looking door which once opened, Ozod’s family home revealed its size and lushness in front of us. A huge green garden surrounded on three sides with white buildings housing Ozod’s mother, his relatives and of course, his pregnant wife and daughter. There was a soft eyed cow living a rather unhappy life, her head craned around to the left because she was too long to fit lengthwards in her cage. Imagine spending your entire life standing in your own poo and looking at your bum, not so nice. We were made amazing lunch – plov the traditional dish of the meaty and non-meaty varieties, lots of fresh fruit from their garden and hot chai. Andrew drank a whiskey shot with Ozod’s father for prosperity and respect and all of the things men drink for. We spoke at length about the family’s future plans to live in America, Korea or somewhere abroad (like Australia for instance, did we think we’d be able to help them immigrate? Maybe possibly?). After lunch we were treated to a video version of their wedding – lots of cars rented in the honour, lots of posing for photos and lots of noise and cheerful celebration. After watching some of Alleykat’s videos too, we said goodbye, full of food and enjoyment. Soon we’d hopped on the last train for a while and met two English teachers, Dildora and Maydena, who invited us to meet them sometime when we were in the city of Tashkent. 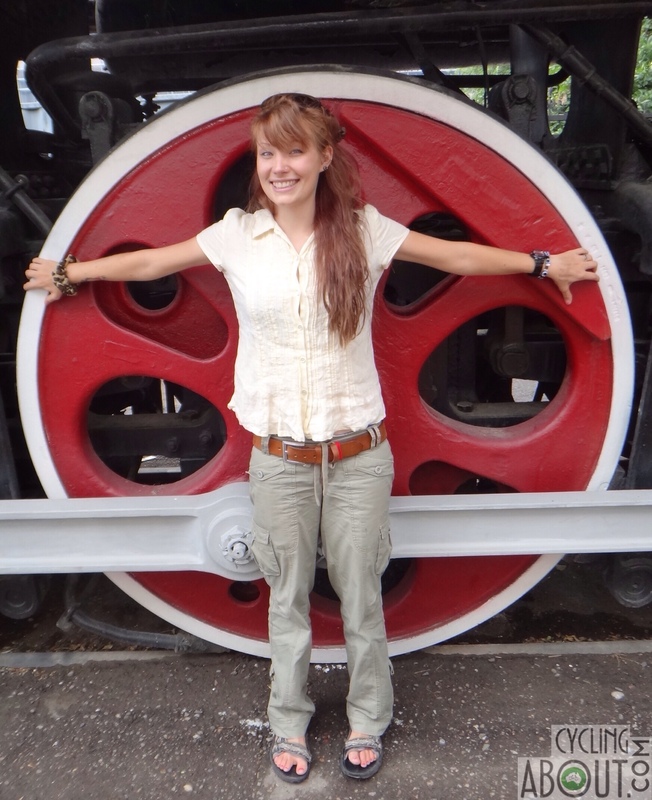 We officially moved to Tashkent – via a visit to the Tashkent Train Museum for Kat and her dad – to spend one last night with Kat’s parents in one last fancy hotel. The last supper was at Karavan, a very tasty Uzbek restaurant and place to drink a good number of toasts to our time together. All too soon, Kat’s mum and dad left at 1am for the airport after a good lot of hugs and kisses all round. We Alleykats spent the night before enjoying at length the excellent breakfast buffet (pancakes, porridge, eggs, omelettes, breads, cereals, plain yoghurt, conserves, oodles of fruit, vegetables, hot drinks, cold drinks, and everything you could possibly think of for breakfast – except bacon for those of you thinking it – it’s a Muslim country, silly!). 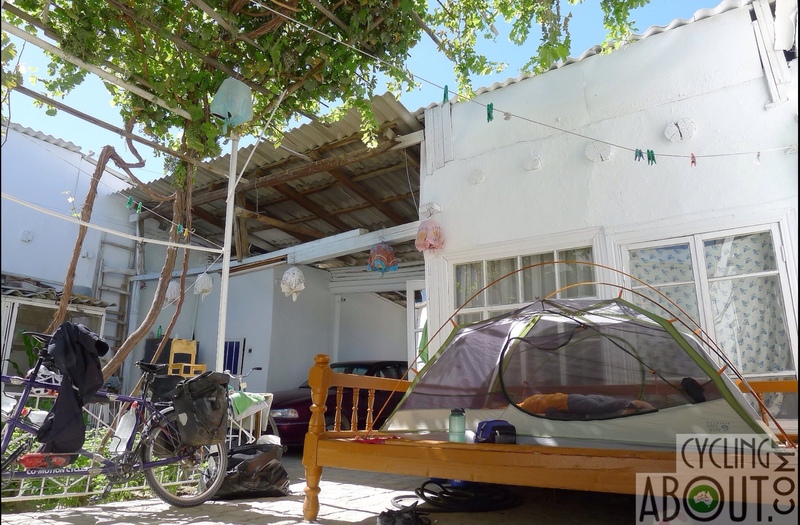 After luxuriating as long as we could, we moved to Ali’s guesthouse and were offed beer and vodka on arrival. Ali was a strange dude, the place itself wasn’t marked (no sign at the road or even above the door!) The place is only findable via some fairly excellent directions given in the 2008 Lonely Planet. We later learned that Ali doesn’t have a license to practice as a hotel or hostel anymore but continues to do so illegally. Because, what else is he going to do with his massive selection of ramshackle rooms and verandas?! Now, you might be wondering why we were persisting in staying in hostels and hotels – rightly so – Alleykat would have preferred to get amongst it (it being local life) after Andrew and Ruth left us, however, Uzbekistan is a ‘Police State’ with rules and regulations in cahoots with their unbelievably difficult visa issuing policy. We’d ascertained that we needed to ‘register’ with our hotel/hostel accommodations every three days. Read more about these guidelines and visa policies HERE. 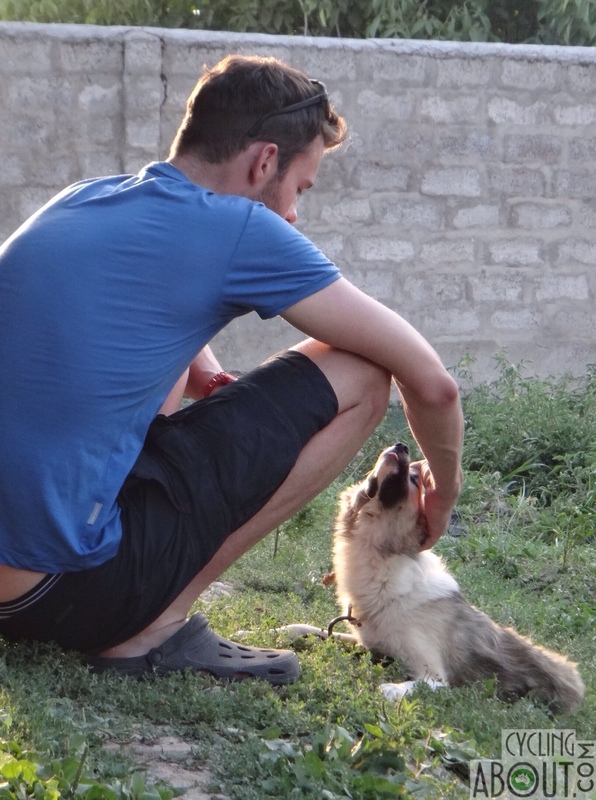 We met Matt and immediately hit it off – a fellow bike tourer from the UK whose buddy Alexei was in Samarkand with his girlfriend Sammy enjoying the few days they had together. We hung out with Matt most hours of the day except when we had to get things done occasionally. We tried to meet up with Dildora but after waiting at the meeting spot for an hour we left and later received her message that she was at a job interview and couldn’t make it. We arranged another meeting for later that week. Together we three ate Korean food (because there is a sizeable Korean population left over from the Soviet era), wandered around the city and spent loads of time talking and laughing out loud until Matt left with his girlfriend Diana to swap places with Alexei – the couple would spend a few days of ‘quality time’ in Samarkand and we’d have Alexei all to ourselves. We spent time with Alexei visiting the same excellent Korean restaurant, more walking and more missing out on meeting up with Dildora, this time it was our turn to be late, only ten minutes but by that time she’d gone and didn’t respond to any of our further emails, ah well such is life. 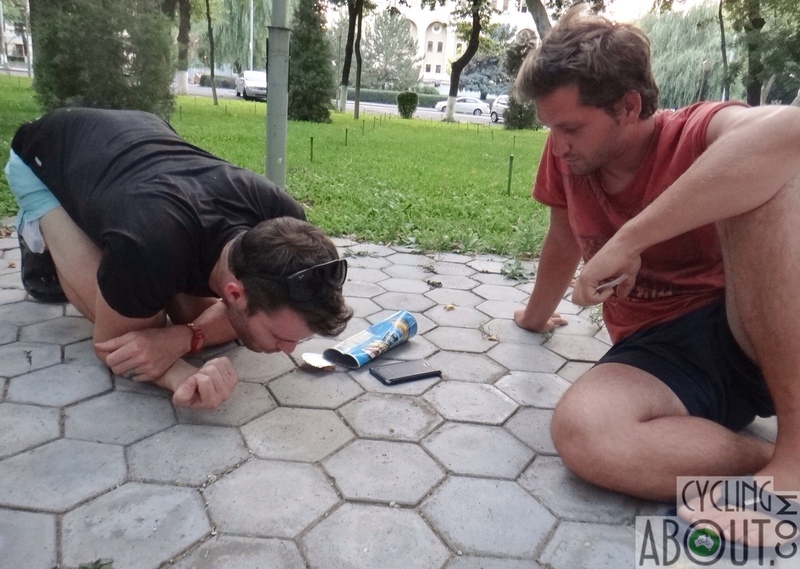 We also played with ants and really learned a lot about each other as we did so. The penultimate night we were in Tashy-K (as it is fondly known among strange British – and British colonies – bike tourers) we spent altogether with Alexei, Matt and Diana, ate amazing Italian food and laughed a lot. The next day we ate ice cream and drank coffee together before Diana said goodbye and the next day we said a sad goodbye to Matt and Alexei and their lovely Long Haul Truckers. They had become so intimate with these bikes that they’d named them: Alexei’s was Tornade (after Zorro’s horse) and Matt’s was Bernadette. Alleykat and TanNayNay rode out on the day before Kat’s birthday – into a head wind. As advised by Kat’s magical physio who she’d been liaising with over Skype, we travelled around fifty kilometres for the day. Initially we asked some fellows by the side of the road if they knew of a person we could stay with but unfortunately, even though the best English speakers they were related to were called out to communicate with us (literally connected by telephone to somewhere in the USA) they were reluctant to give us a definite home, so we moved on. A few kilometres later we knocked on a promising-looking slightly-open door and said (and I quote) ‘Salam Alaikum, could we stay with you?’ It was as simple as that; making little tent signs with our hands and the smiled word ‘palatka’ with our mouthes was enough to convince this family to allow us to pop our tent in their yard. Môtabar and her family (husband, mother, father, sisters and their husbands, brothers and their wives and all of their children) all turned up over time – funnily enough for one of the sister’s birthday the next day. Of course we would be staying with an Uzbek family who housed Kat’s twin, of course. 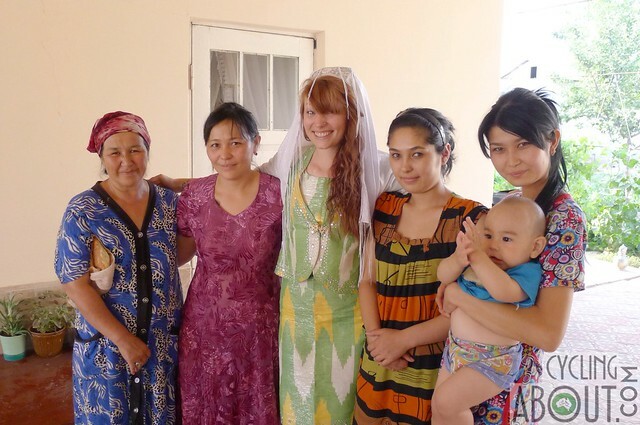 The sisters and wives dressed Kat up in traditional Uzbek marriage dress and we all had a good laugh. 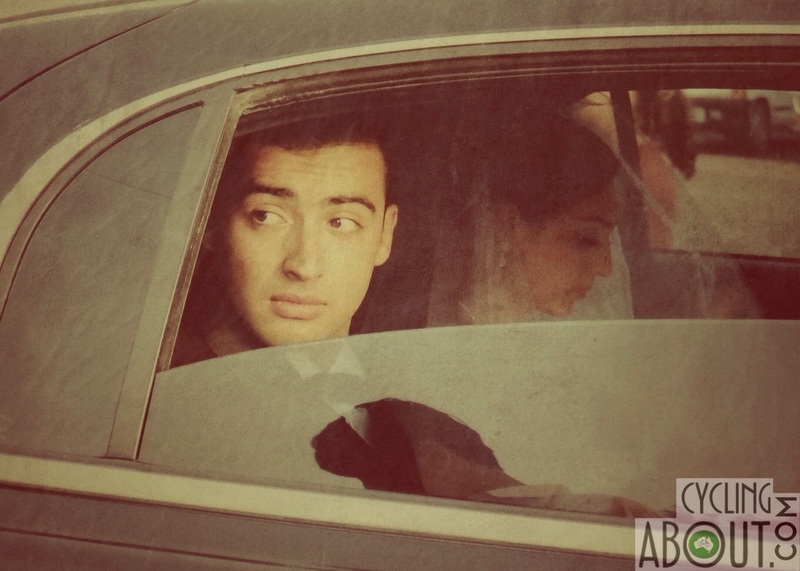 We watched Sanobar and Shermohammad’s wedding video where, as is tradition, the complete six hours were caught on film. We were thankfully shown a truncated version. A lot of the motion picture seemed to be focused on close ups of the fancy rented cars, the usual serious “in love” scenes done in a flower garden, the traditional tuneful singing at the wedding and the seriously tuneless serenading (with voice and vuvusaela) of the bride and groom before and after the ceremony. Interesting to compare it with Ozod’s video. So there they were; Kat and Nilufar, born of the eleventh of July. We were cooked a lovely dinner, the boom box was set up in their honour and the night was danced away. Kat’s birthday was an understated day – a present unwrapped from Matt and Diana (thanks guys!) a bracelet still worn today. Breakfast was sneakily prepared behind the house next to the family’s corn field and vegetable garden because no matter how often we try to explain to people that we need to imbibe our big energy bowl of porridge before riding, people are too kind for comfort and too often make us breakfast of high glycemic index foods which, although delicious, are burned through within minutes of being on the bike. Grandma Maxsuda sneakily provided us with freshly milked milk, having discovered our little set-up. Nothing quite like milk from a cow that you’ve patted, spent the night sleeping next to and listened to her chewing cud for a good long while. We stopped for lunch and were happened upon by a local who wanted to speak English with us and have us at his home. Unfortunately we didn’t quite have enough time for this as we had to get to the border before our visas ran out – and also he was quite a bit of a weirdo! 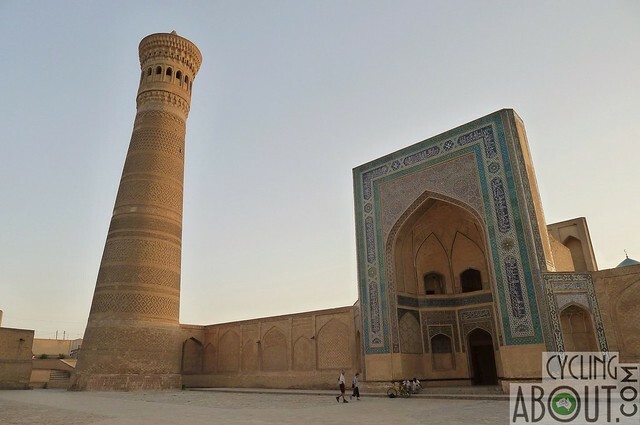 Yet another invitation did make us realise however that we probably weren’t going to go back to any paid accommodation for our remaining time in Uzbekistan – registration be damned! That afternoon we began climbing a large hill (aka a mountain) and after weaving enough distance of tightly knit kilometres for the day we stopped on a crest and asked a couple of girls selling cheese balls and kumis if they might have a place for us. 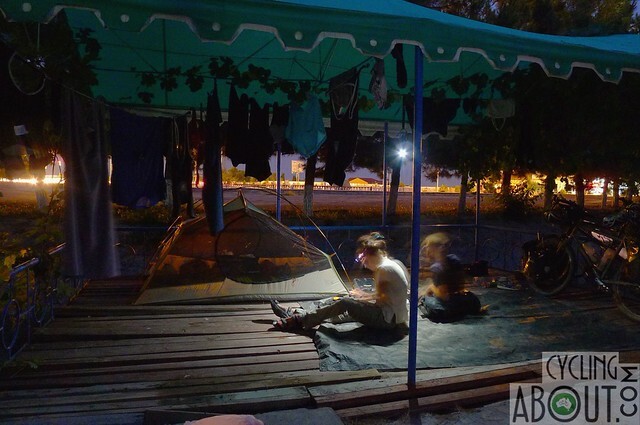 Within minutes we were wheeling down to their garden and setting up camp on a chai table. We met the family and of course were given fresh food – this time a massive bowl of homemade yoghurt. We halved a heap of apricots picked straight from the tree and lunched richly. We watched videos with the kids and played with kittens and ate melons and grapes from their garden. In the morning we were woken by early bird roosters who started crowing at 4am. We had to move our sleeping bag and mats away from the noise for a few hours – it was all too much! After more fresh milk from their beautiful soft, creamy coloured cow, we rode over the pass ahead of us. An enjoyable climb, where the top was almost-visible-definitely-glimpsable the whole time. There were switchbacks galore and many sulphur-loaded trucks a-passing but these were tempered by that ever-looming top just around the corner. A little way down the other side we were luxuriating at a restaurant when we called out “Hey! Stop!” to a passing black blur of touring cyclist. Stefan was a German fellow heading to the border the day before us and so why not team up and ride as a pack? That afternoon as eighty kilometres rolled over (including a good half of that spent speeding down hill!) we turned off the main road to find a camp. Alex asked a local farmer if we could tent in his field but, as he didn’t own the one we were gesturing towards we instead followed him a little way down the rough road and set up opposite his house. He and his wife and four daughters lived in a small mud brick house with only two walls and no glass in the windows. We wondered, despite their sunny disposition and generosity (they gave us each a huge bowl of their offal soup dinner as well as chai and bread) what would happen to them in winter? Their house didn’t look like it would cope especially well with anything less than about twenty degrees and their pockets didn’t look like they were lined with money… we wondered. 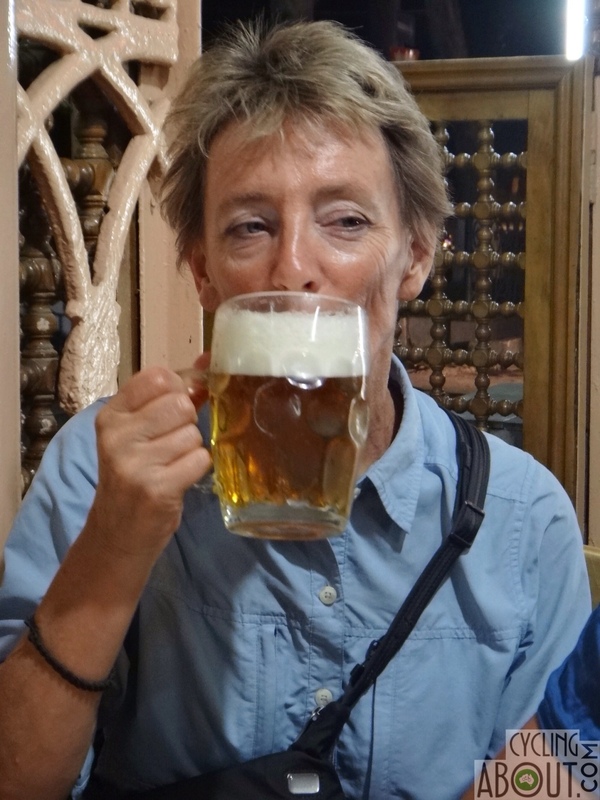 Another day swang past, we stopped for a drink in Chust and inevitably gathered the attention of locals. Soon about fifteen men were chatting to us, buying us amazing melons (half way between a cantaloupe and a watermelon – cantaloupe flavour with the texture of a firm juicy watermelon, lip-lickingly delicious) and asking us to ‘just wait fifteen minutes’ via the use of their mobile phone google translator. Fifteen minutes of waiting turned up a knife – a beautiful gift personally engraved from Chust (which is apparently famous for its knives all over Uzbekistan). We rode on. 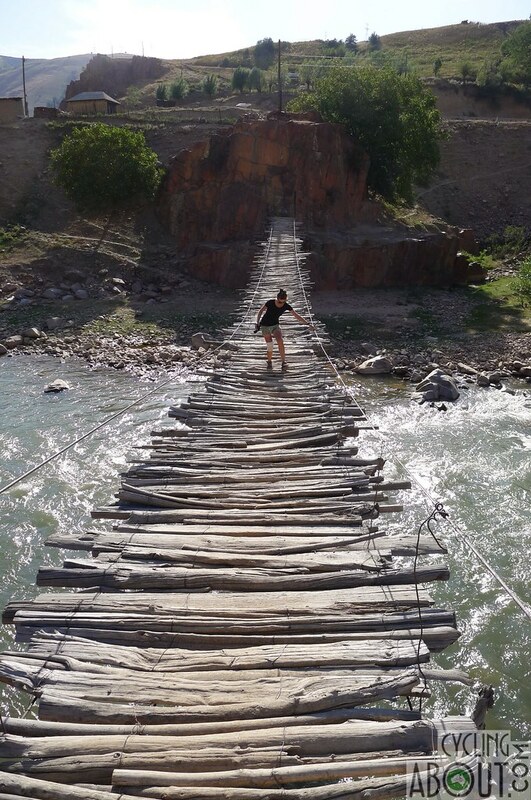 Namangan was a small city on the map, but stretched itself largely in front of us. The hotels were so overpriced that we doubt they get any patrons at all. Pity was taken on us by an interested bloke in a car, who lead us to his mate’s place at the International Tennis Centre. We were accompanied by two very young boys on very small, very old, very almost-about-to-break bikes without brakes all the way up the hill. After some initial brokering of a deal, our bloke-in-a-car saviour disappeared and then we just had to contend with the caretaker. Unfortunately something was lost in translation and the room we thought we had was no longer on offer. We did however get to use the amazing shower facilities for the athletes who train and live there, which came now suddenly for a price once we’d all been in and washed. A bit dodgy on the caretaker’s behalf but sometimes that’s just the way it is. We set up in a unused part of the park and tried our best to fend off our new caretaker ‘friend’ who hung around like a fly near a smell. We definitely no longer smelt and were a bit creeped out by him and his buzzing but he eventually zoomed off and settled thirty metres away, seemingly content to watch us from afar. Another hot day on the bikes saw us riding headlong into the wind. Stefan needed to make it all the way to the border but we decided to stop a few kilometres before (to cross the next day, the last day of our Uzbek visas in order to get the most out of our two months of Kyrgyz on-entry visas) to make a last chai with Stefan. Our camp that night was under the stars – no fly, tenting is the life. Early the next morning we were awoken by everyone else starting their day – it was time for us to go, as soon as the sun hit us it was already well over thirty degrees. We moved spots to make breakfast and ran out of water very quickly, our dry mouths felt like crusty wounds in the relentless heat – time to get some elixir of life. Uchkorgon was the border town and the five litres of water we bought and swilled was sweet relief. We needed to search for the Internet after a good slug of time without it. Just as we intended to breeze through the town, we were adopted by brothers Ibrahim and Azanjan who spoke outstandingly good English and it took the full day of being shown around the whole city, lunched and icecreamed until we could icecream no more. The brothers and their friends were so kind, we couldn’t believe the generosity we were about to leave behind. They said a part for our Uzbekistan movie and we headed off reluctantly. The border was twenty kilometres from where our 2008 guidebook said it was (it’s being rebuilt just down the road) and so we were a bit worried it would close before we got there, after such a long day spent with the boys. But, no matter, we spent the usual hour of waiting for nothing and everything and something unknown to happen with our passports at the border and were soon free to go. At the other side we met a Norweigan couple and told them that there was a lovely pair of brothers awaiting them on the other side (leaving them a fairly good set of directions to meet Azanjan and Ibrahim if they wanted). Uzbekistan ended on a very tuneful note. Thanks boys. 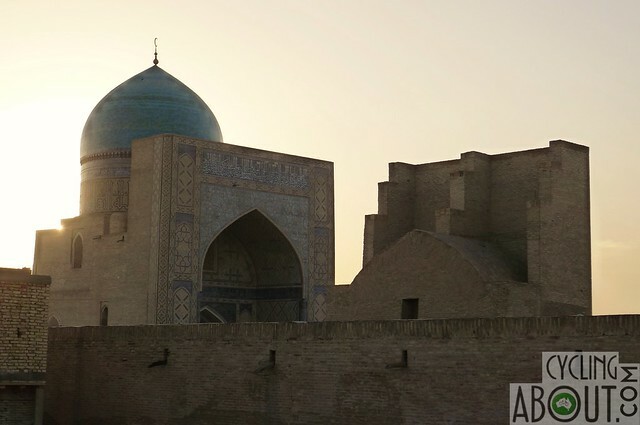 Make sure you catch our film about Uzbekistan!